First to Finish competitors previously barred from race’s hardware are now eligible. SOUTHERN CALIFORNIA — The field for Transpac’s First to Finish “Barn Door” trophy might be a little more crowded in 2019, as eligibility requirements for monohull yachts racing in the biannual event were loosened by the Transpacific Yacht Club’s board of directors, it was recently announced. All restrictions on use of moveable ballasts or non-manual power will be removed from the notice of race for the 2019 Transpacific – or Transpac – Yacht Race. The next edition of the race, which will be Transpac’s 50th, is expected to start during the week of July 8, 2019. First-to-finish participants are restricted from competing in vessels larger than 100 feet (30.48 meters) in length. Changes were made to keep Transpac consistent with other ocean races in the world, such as Fastnet, Middle Sea and Sydney-Hobart. 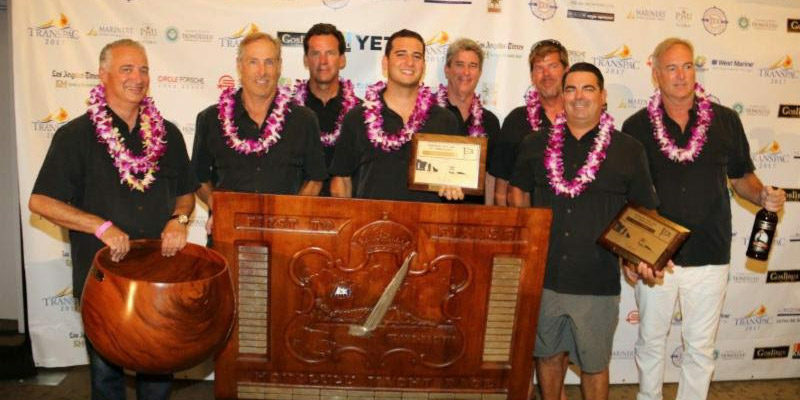 Monohulls entered with moveable ballasts or non-manual power were eligible to compete for the “Barn Door” trophy. However First to Finish participants with such systems aboard were barred from winning the “Barn Door” between 2009 and 2017, instead being in the running for the Merlin Trophy, according to race organizers. Previous First to Finish winners were Dorade (1936), Ticonderoga (1963-65), Ragtime (1973-74), Merlin (1977, 1981, 1987) and Pyewacket (1997-99, 2007). Among the eligible vessels for the “Barn Door” are IMOCA 60s, Volvo 70s and SuperMaxis. “We are mindful of the traditions of Transpac to encourage the amateur yachtsman to participate in this great race and adventure across the Pacific,” Transpacific YC Commodore Tom Hogan said in a released statement. “This race will continue to attract those who want to challenge themselves and the sea, and we will continue to have many great awards to recognize their achievements in racing under handicap. “Yet we also want to be among the other great races of the world in offering one of our oldest trophies to those who push the boundaries of technology to go as fast as possible in quest of higher and higher performance,” Hogan continued. The Notice of Race of the 50th Transpac race will be available in early 2018, according to organizers. Questions about the race and selection criteria can be directed to Transpacific YC Technical Committee Chairman Alan Andrews at alan@andrewsyacht.com. Visit transpactyc.com for more information on the 2017 and earlier editions of the race. Transpac is a 2,225-mile biennial ocean race between Los Angeles and Honolulu, Hawai’i. The first edition of the race was run in 1906.